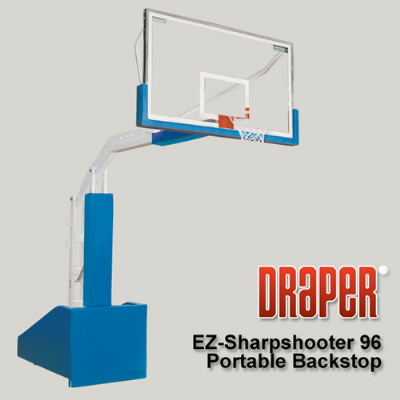 Draper’s EZ-Sharpshooter 96 is our portable backstop designed to succeed at high levels of competition. EZ-Sharpshooter 96 is an affordable choice for facilities looking for premium competition court and side court systems. Low maintenance extension spring technology design makes one-person setup and height adjustment easy and fast. Backstop features 96" extension from padded front to face of the backboard, official sized glass backboard, 180° breakaway goal, bolt on edge padding and rear anchoring system to meet NFHS and NCAA rule requirements. 96" (244cm) of safe play area with goal at 10’ (305cm) playing height. Has 96" (244cm) of safe play area with goal at 10' (305cm) playing height. Features rear anchor kit and added structural members, ballast and horizontal beam padding to allow high school or college competition play. Front stabilizers lock in place for maximum play stability. Front and sides padded with 2" thick polyurethane foam wrapped in choice of 12 colors of vinyl. Bolt-On Edge padding color matches base pad color. Goal height is adjustable from 7' (213cm) to 10' (305cm) in 6" (152mm) increments for players of all ages.